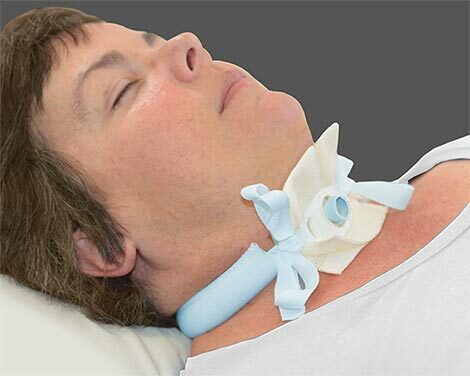 The Trach Tamer is used primarily in special care and security, i.e. physically-challenged or chronic illness. The foam collar provides comfort for extended periods of time, and the cotton twill ends are tied to the tube holder flange openings, providing a secure application of the tube. This device can be used with neonatal to adult patients and in conjunction with the Circuit Secure. The B7022-Circuit Secure is a Tracheotomy Tube Anti-Disconnect Device. The Circuit Secure is used with the Trach Tamer, or similar "collars", for ventilator patients. Copyright © 2019 ErgoMed, Inc. All Rights Reserved. Contact Us.